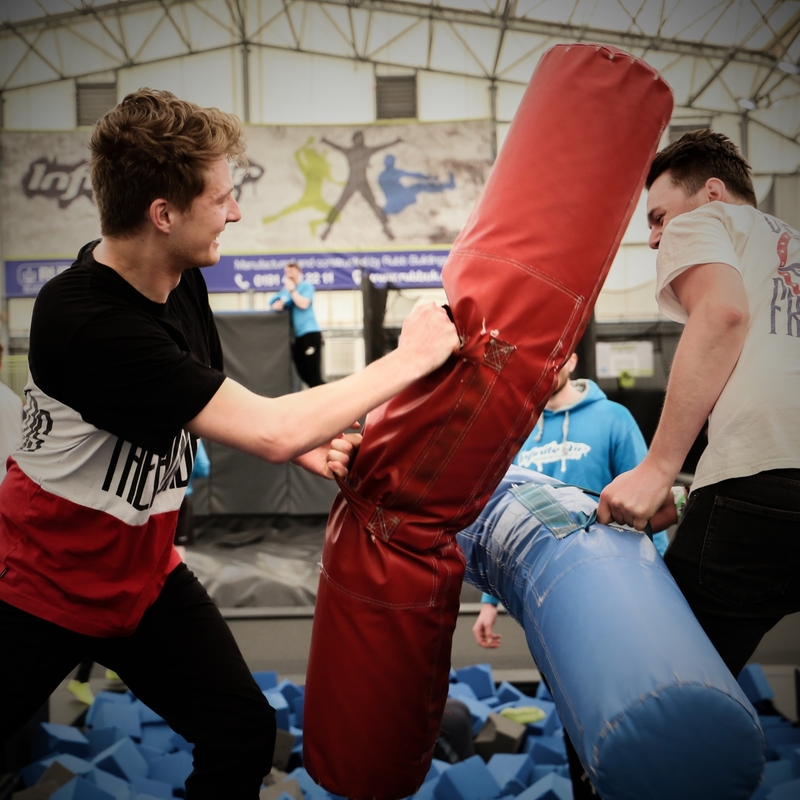 For hygiene and grip all participants must wear Infinite Air grip socks in the trampoline park, which are included in the price of your session and yours to keep. Price includes VAT and gives access to all of the trampoline activities. Infinite Air socks / Infinite Air approved footwear must be worn at all times by any participants. Every participant must receive a full safety briefing on every visit. Make sure you’re happy with our refunds policy. Open access sessions include access to the whole trampoline park. There are many activities which you can try out so take a look below at what’s on offer. Please note that some things may not be suitable for younger ones. 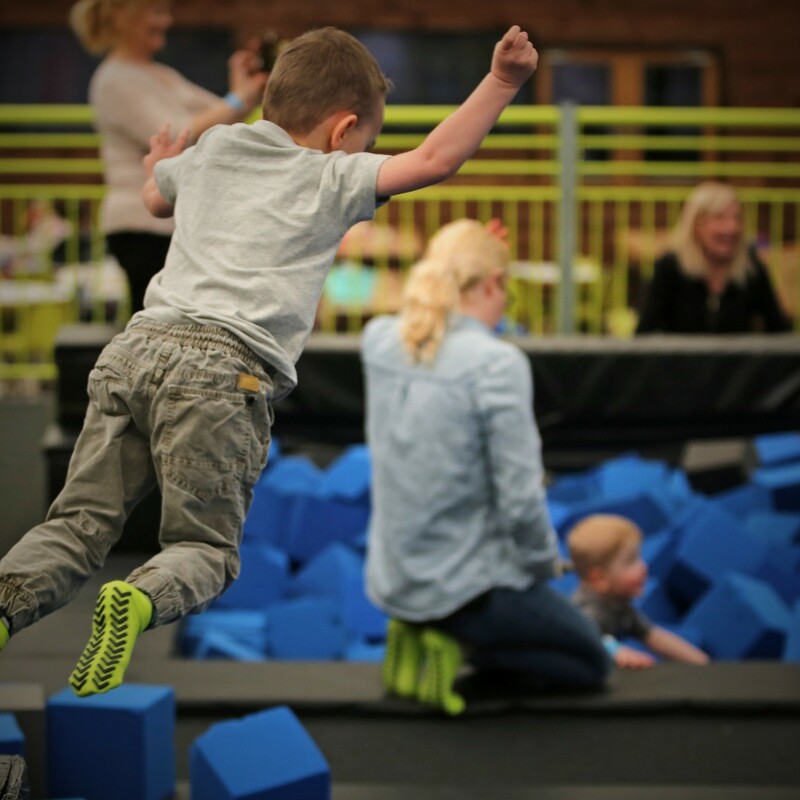 Family jump and tots session have some limitations, take a look at the session info to find out more. 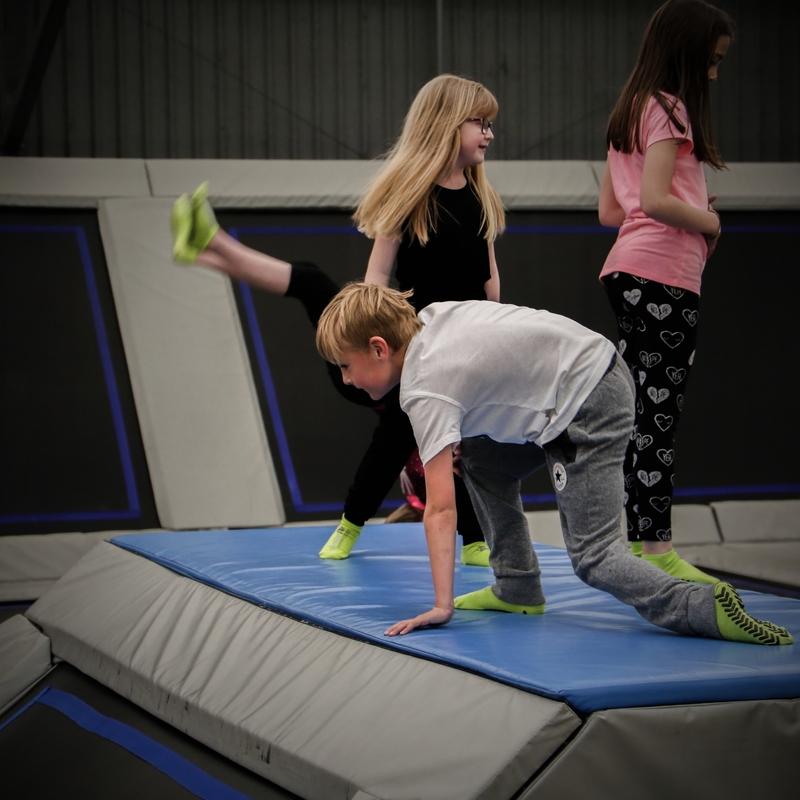 Hone your skills and learn a few new tricks on our gymnastic competition style trampoline beds. These allow for greater control so you can really show what you’re made of. 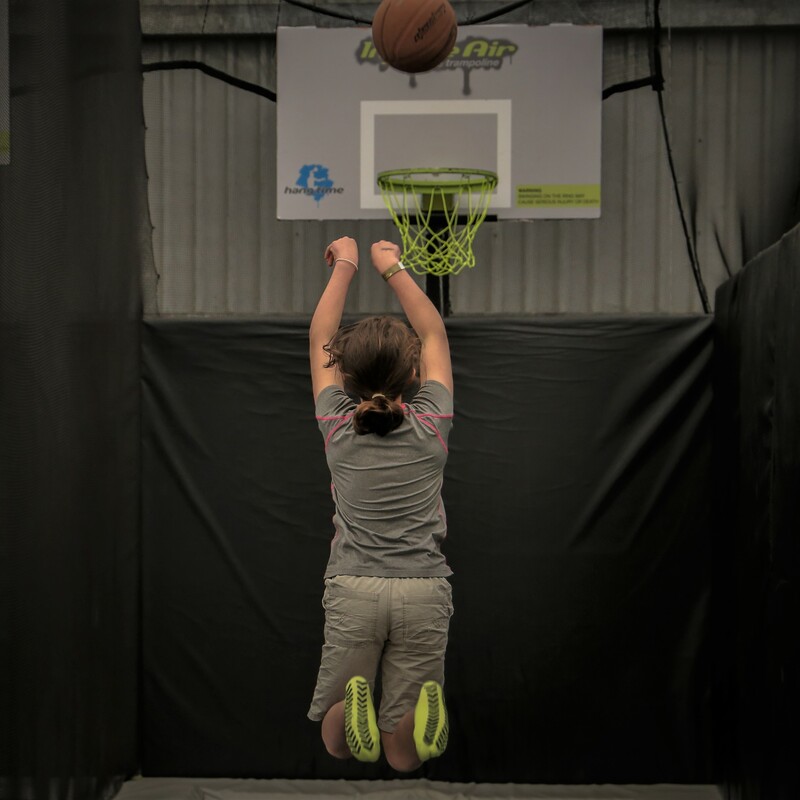 With 3 different height nets and trampoline tracks, you will feel like a giant as you rise above the hoop and dunk like you never thought possible. Can you pass the ball round the back, or between your legs and still get 2 points? Our foam pits give you an opportunity to fly to higher heights and land on the cushioning support of thousands of foam blocks. We have a normal trampoline and a performance trampette and podiums you can use for various somersaults and new tricks. Our dodgeball court comprises of 6 large trampoline beds and 8 angled rebound trampolines. A variety of games run throughout the session, simply join the queue and try it out. Get ready to dodge, as this is a competitive arena. 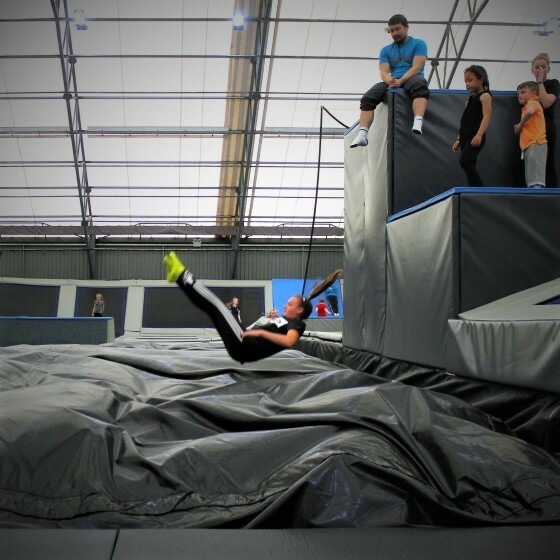 Our Main Arena has over 40 trampolines and box sections, you’ll be bouncing all over the place. Express yourself on a single bed or on a number of tumble tracks or bring your Parkour skills to the raised platforms. Wall Run has 3 performance trampolines allowing the initiated to literally walk up walls and defy gravity. There are two wall heights to master, and it will take time, so don’t beat yourself up if you don’t get it first time! See you on the wall. Take your positions above the foam pit and commence battle with your giant battle stick. Who will be victorious and who will plummet to the hand of the enemy? Who can take the title of undefeated champion? Standing at nearly 3 metres above the podium floor, you look down on our huge airbag, and all eyes are on you. You’re at the highest point in Infinite Air, looking out over the whole park, waiting to jump! Infinite Air is an urban and extreme sports centre where injuries can happen. Like all sports, participants need to decide if the benefits of taking part are worth the risk of injury. Following these rules will vastly reduce the likelihood of any participant sustaining an injury, please follow all rules presented throughout the park through printed rules, safety briefing or verbal instruction from staff. No food and drink can be brought into Infinite Air, unless by prior arrangement for the purposes of an organised party and no chewing gum allowed. Only jump within your own skill level. You must follow any verbal instruction and if in doubt about any rules, ask the Air Crew. Infinite Air grip socks must be worn at all times for hygiene and safety purposes.